The Canadian Grand Prix is always exciting, and with rain looming and 6 drivers in the mix for victory, Sunday’s race was no exception. Defending Formula 1 World Champion Lewis Hamilton took his 5th pole position in Montreal Saturday, edging out MercedesAMG teammate Nico Rosberg at the top of the time sheets. With Ferrari’s Sebastian Vettel 3rd and the Red Bulls of Daniel Ricciardo and Max Verstappen just behind, Hamilton understood that he faces a stiff challenge for victory. Thus, setting the stage for a thrilling event at Montreal’s Circuit Gilles Villeneuve. Mr. Hamilton managed to pass Mr. Vettel after the German switched to a 2-stop strategy and the 3X world champion took advantage to record his 2nd victory of the season. His German team-mate Nico Rosberg was 2nd on the grid at the start of the race but dropped back to 10th early on before suffering a puncture and ending up 5th. Mr. Hamilton leapfrogged the fast-starting Sebastian Vettel when Ferrari opted to keep the German on a 2 stop pit strategy to Mr. Hamilton’s one. Despite fresher tires for the run home, Mr. Vettel was unable to catch Mr. Hamilton who took a 5th victory in Montreal. Valtteri Bottas took the 3rd podium position, the Williams team’s 1st for Y 2016, with Max Verstappen 4th. Nico Rosberg finished 5th after a disastrous day, allowing Mr. Hamilton to move to cut his championship lead to just 9 points. Daniel Ricciardo finished 7th after being in the wrong place at the wrong time all day. 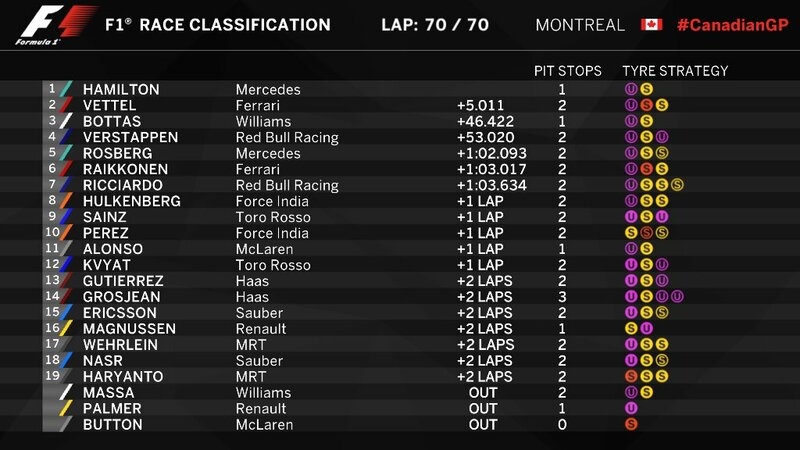 Here is how they finished at the Canadian Grand Prix.